The Farquhar College of Arts and Sciences welcomed acclaimed novelist and poet Louise Murphy as the first guest of the college's 2009-2010 Distinguished Speakers Series. Murphy was the keynote speaker at Nova Southeastern University's 2009 Convocation ceremony, an annual gathering of the campus community to mark the beginning of the undergraduate academic year. Convocation was held on Tuesday, September 8, 2009. Murphy is the author of the 2003 novel, The True Story of Hansel and Gretel: A Novel of War and Survival, a revision of the Brothers Grimm fairy tale that revolves around two Jewish children in Nazi-occupied Poland, whose parents must abandon them at the entrance to the Bialowieza Forest. Born in 1943 in Bowling Green, Kentucky, Murphy began writing stories when she was five years old. 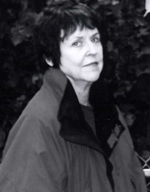 An avid reader and prolific writer, she attended the University of Kentucky and taught English to middle-school students in Newark, Delaware, before moving to California in 1968. There, she raised her two children and received a Master of Arts degree in Creative Writing from San Francisco State University, where she taught for five years. She later taught novel writing at Acalanes Adult Education in Lafayette, California. Murphy also is the author of the 1980 children's book, My Garden, A Journal for Gardening around the Year, and the 1985 adult novel, The Sea Within. Murphy is the winner of a Writer's Digest award for formal poetry. In 2003, she was awarded the Shaunt Basmajian Chapbook Award for her chapbook, Pilgrimage. Her writing and poetry has been published in numerous journals and magazines. Murphy lives in northern California, where she is working on another novel. Besides reading and writing, she enjoys playing the flute, opera, and classical music. Each year, the Farquhar College of Arts and Sciences organizes its academic programming around an annual theme. Murphy was the first of the distinguished speakers for the year to address the 2009-2010 annual theme of "Good and Evil." For more information on the NSU 2009 Conovocation ceremony, contact the Office of the Dean in the Farquhar College of Arts and Sciences at (954) 262-8236 or convocation@nova.edu.